Thanks to an agreement between the U.S. and Mexico, water is flowing to 35 million people in both countries along the Colorado River Delta. At least for now. Karl Flessa, a geoscientist, has studied the damage and restoration along the Colorado River Delta, which runs from the U.S. to Mexico. He recently watched people splash in the flowing water, saying, "It doesn't get any better than this." That push for restoration paid off. Mexico is releasing part of its river allotment for eight weeks — the first time ever that water has been released to benefit the environment. It's called a pulse flow because it mimics a spring flood: a one-time event, before possible drought restrictions. Wearing sunscreen and a cowboy hat, Flessa gets behind the wheel of an SUV and heads south to see how far the water has reached. "We're chasing the river," he explains. What was once the Colorado River is now a mile-wide riverbed filled with shrubs and salt cedar. Just as in the U.S., Mexico normally uses the water only for cities and farms. "We're driving through an agricultural country," Flessa says. "There are some date palms here on the left. That looks like wheat over there on the right." As co-chief scientist for the pulse flow, Flessa is coordinating dozens of other scientists studying the flow. 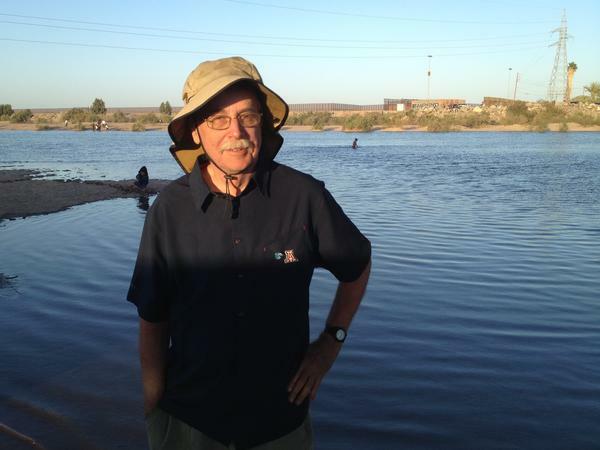 Francisco Zamora of the Sonoran Institute wants to know how far the water goes. If it reaches the Gulf of California, fresh water and seawater can mix to nourish natural fish and shrimp hatcheries. "Marine species will be able to then travel upstream," Zamora says. "The river will be connected again with the ocean." Karen Schlatter, who is also with the Sonoran Institute, leads us across about 75 acres, bulldozed to remove nonnative trees. She is researching how river water might establish new native trees. Before the water arrives, cottonwoods and willows are dropping their puffy seeds. "The idea is that with additional water, the seed will just land on the ground and sprout," Schlatter says. More trees mean more birds. Hundreds of species use this route to migrate along the Pacific Flyway. "How many ducks there are in the rest of North America, which is of great interest to duck hunters, depends to some extent on having places along the Pacific Flyway for them to stop and store up and drink some water," Flessa says. Back in the SUV, Flessa is heading north to find the flow. Crossing the San Luis Bridge 25 miles south of Morelos Dam, he spots it. "There's the river down below, and everybody's here to watch the river," Flessa says. "Look at all those cars." People from the city of San Luis Rio Colorado, named after the river, are splashing in it as music plays. Many of the children have never seen it flowing. "It's just tremendously gratifying. It's the highlight of my career, frankly," Flessa says. "It doesn't get any better than this." If part of the Delta restoration takes hold, this scene could be repeated every few years. The Colorado River once flowed freely from the Rocky Mountains through the Grand Canyon, across the U.S.-Mexico border and into the Gulf of California. But not so for the past half century. Dams along the way divert the river to 35 million people in cities and farms on both sides of the border. As a result, the 3,000-square-mile Colorado River Delta, where the river meets the sea, has been dry. 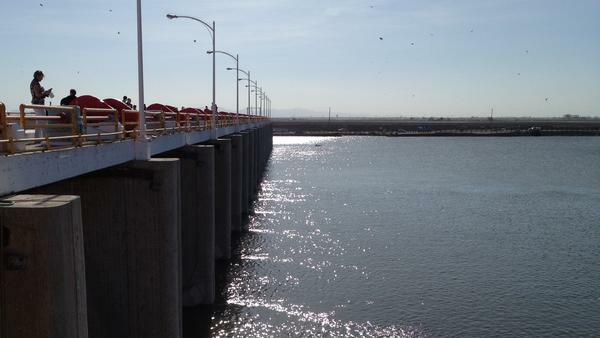 Now, thanks to an agreement between the U.S. and Mexico, water is flowing to the delta once again temporarily. NPR's Ted Robbins has our story. TED ROBBINS, BYLINE: Millions of gallons of water used to flow every day from the Rocky Mountains to the Gulf of California. Now, the Colorado River ends here, at Morelos Dam on the U.S.-Mexico border. Below here, one of North America's largest wetlands is dry. University of Arizona geoscientist Karl Flessa began researching the damage two decades ago. KARL FLESSA: And from that, we gradually shifted into asking a more positive question of well, how much water would it take to bring back some of these habitats? ROBBINS: That push for restoration paid off. Mexico is releasing part of its river allotment for eight weeks, the first time ever that water has been released to benefit the environment. It's called a pulse flow because it mimics a spring flood, a one-time event done this year before possible drought restrictions. Wearing sunscreen and a cowboy hat, Karl Flessa gets behind the wheel of an SUV and heads south to see how far the water has reached. FLESSA: Yeah. We're chasing the river. ROBBINS: What was the Colorado River is now a mile-wide riverbed filled with shrubs and salt cedar. Just as in the U.S., Mexico normally uses this water only for cities and farms. FLESSA: We're driving through an agricultural country. There are some date palms here on the left, and that looks like wheat over there on the right. ROBBINS: Karl Flessa is the co-chief scientist for the pulse flow. He's coordinating dozens of other scientists studying it. Francisco Zamora of the Sonoran Institute wants to know how far the water goes. If it reaches the Gulf of California, fresh water and seawater can mix to nourish natural fish and shrimp hatcheries. FRANCISCO ZAMORA: Marine species will be able to then travel upstream, thus the river will be connected again with the ocean. ROBBINS: Karen Schlatter leads us across 75 acres or so that's been bulldozed to remove non-native trees. Schlatter is also with the Sonoran Institute. She is researching how river water might establish new native trees. Before the water arrives, cottonwoods and willows are dropping their puffy seeds. KAREN SCHLATTER: And the idea is that with water - with additional water, the seed will just land on the ground and sprout. ROBBINS: More trees mean more birds. Hundreds of species use this route to migrate along the Pacific Flyway. FLESSA: How many ducks there are, you know, in the rest of North America, which is of great interest to duck hunters, depends to some extent on having places on the Pacific Flyway for them to stop and store up and drink some water and get on their way. ROBBINS: We get in the SUV and head back north to find the flow. As we cross the San Luis Bridge, 25 miles south of Morelos Dam, Karl Flessa spots it. FLESSA: There's the river down below, and everybody is here to watch the river. Look at all those cars. ROBBINS: People from the city of San Luis Rio Colorado - named after the river - are splashing in it. Many of the children have never seen it flowing. FLESSA: It's just tremendously gratifying. It's, you know, it's the highlight of my career, frankly, you know? It doesn't get better than this. ROBBINS: If part of the delta restoration takes hold, this scene could be repeated every few years. Ted Robbins, NPR News.